Let it be known that the material taken from my cousin's site has been used to present my family connection with that of the Negroni Family in Puerto Rico. I would first like to present my cousin Hector Andres Negroni Becerra who continued the senior Negroni line in Puerto Rico. I met my cousin approximately 5 years ago. Hector Andres Negroni Becerra is a very impressive individual to say the least. Hector Andres has a BS Engineering degree from the US Air Force Acaderny and an MA in Hispanic Studies from the University of Puerto Rico. He was the first Puerto Rican graduate of the Air Force Academy, a Fighter Pilot of 24 years. Colonel Negroni retired from the Air Force to become an industry executive. Updated Material: (Hector Andres Negroni) While I was searching the web... I came across more material on my cousin retired Colonel Negroni. He was born January 30, 1938 in Yauco, Puerto Rico and in 1953, after completing primary studies in Puerto Rican schools, he moved to the United States with his parents. He attended high schools in Santa Rosa, California, Veracruz, Mexico and Philadelphia, Pennsylvania, graduating from Frankford High School, Philadelphia, Pennsylvania in 1956. After studying one year of civil engineering at Drexel University, he received appointments for all three service academies (West Point, Annapolis, and Colorado Springs) and chose the United States Air Force Academy in Colorado Springs, Colorado. 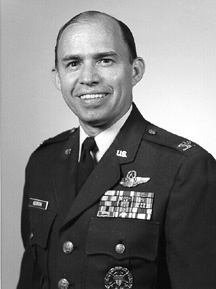 In l96l he was the first Puerto Rican to graduate from the United States Air Force Academy and received a bachelor of science degree in Engineering with a major in Public Affairs, navigator wings, and a regular commission as a second lieutenant in the United States Air Force. In 1967 he graduated from the Universidad de Puerto Rico with a master of arts degree in Hispanic Studies. He is also an honor graduate of the Industrial College of the Armed Forces and a graduate of the Air War College. After completing pilot training at Reese Air Force Base, Texas, he received his pilot wings in 1962. From 1962 to 1964 he was assigned to the 43lst Air Refueling Squadron, Biggs Air Force Base, Texas, as a KB-50J pilot. In 1964 he received an Air Force scholarship to pursue a special masters degree at the Universidad de Puerto Rico. While there he flew T-33s and F-86Hs as an Advisor to the Puerto Rico Air National Guard's 198th Tactical Fighter Squadron and U-3As as an Airmanship Instructor to the Puerto Rico Wing of the Civil Air Patrol. Between 1967 to 1971 he taught and directed all Spanish courses at the United States Air Force Academy as an Assistant Professor of Spanish. He also flew T-33s and T-29s in support of the Academy's flying training programs. Two years later he was assigned to the 317th Tactical Airlift Wing, Pope AFB, North Carolina, serving as an aircraft commander, flight commander, assistant operations officer, and wing chief of aircrew training. During this tour he flew the C-130E and led large aircraft formations while using the Adverse Weather Aerial Delivery System (AWADS) and Station Keeping Equipment (SKE) that allowed airdrop operations in bad weather. In 1977 he was promoted to Lieutenant Colonel and became the Commander of the 3rd Mobile Aerial Port Squadron. This unit was selected as the "Best in Military Airlift Command" for 1977. From 1978 to 1980 he served as the Chief of Liaison for the Joint United States Military Group in Spain. For his significant contributions to the successful implementation of the United States-Spain Treaty of Friendship and Cooperation, he was decorated by the Spanish Government with its highest Air Force peacetime award, the Aeronautical Merit Cross. He returned to the U.S. in 1980 and for the next three years, he was the Latin America Politico-Military Affairs Officer for the Joint Chiefs of Staff in the Pentagon. In 198l he was promoted to Colonel and in May 1983 he was assigned as Vice Commander for the Air District of Washington at Bolling AFB, Washington DC. From May 1985 to October 1985 he was the Chief of the Policy and Management Division, Directorate of International Programs, Deputate of Programs and Resources at the Headquarters United States Air Force in the Pentagon. In October 1985, after 24 years of service, he retired from active duty with the United States Air Force with the rank of Colonel. His many U.S. and foreign decorations and awards include the Legion of Merit, the Defense Meritorious Service Medal the Air Force Meritorious Service Medal, the Air Medal, the Joint Service Commendation Medal, the Air Force Commendation Medal, the Humanitarian Service Medal, the Vietnam Campaign Medal, the Vietnam Service Medal with three battle stars, the Combat Readiness Medal, the Armed Forces Expeditionary Medal, and the Air Force Outstanding Unit Award with "V" for valor. He is a navigator and a command pilot with over 3,500 flying hours in 13 different types of aircraft, including more than 750 combat hours in the Vietnam War. After retiring from the Air Force, he joined McDonnell Douglas Corporation as Manager, International Business Development for the Harpoon anti-ship missile program in McDonnell Douglas Astronautics Company with responsibility for managing international Harpoon activities in seven countries (Japan, Korea, Turkey, Egypt, Israel, Spain, Portugal) and all of Latin America from 1985 to 1987. In 1987 he was appointed Manager International Program Development for McDonnell Aircraft Company where he initiated, developed and implemented policies for fighter aircraft international marketing programs and proposals. His efforts resulted in aircraft sales to Israel, Spain, and Kuwait. In 1990 he was named Vice President Operations (General Manager) for McDonnell Douglas Spain Ltd., a subsidiary of McDonnell Douglas Corporation, where he directed and supervised McDonnell Douglas Corporation activities in Spain as the senior corporation representative. During this period he secured a $20 million modernization contract and the first ever commercial spare parts contract issued by the Spanish Air Force, amounting to $1 million the first year and increasing thereafter. He left McDonnell Douglas in December 1992 to pursue other interests. In 1993 he became a private management consultant specializing in project, marketing, and proposal management. His clients have included professional and trade associations, consumer product companies such as Pfaltzgraff, aviation services companies such as DynAir Fueling, and a number of high tech companies. As Eastern Regional Director for the American Society of Mechanical Engineers, a professional association of over 120,000 members and a $39 million dollar budget, he developed programs to bring the members, academia, and business closer. As Executive Director to the Latin American Management Association (LAMA), a national trade association of almost 500 corporate members, a staff of ten professionals and an operating budget of nearly $2 million, he implemented programs resulting in a 30% increase in revenue and a 32% growth in membership while eliminating a 15% operating budget deficit in less than six months. He prepared two winning contract proposals that provided 66% of the operating budget. Additionally, he organized and led a coalition of thirteen associations in legislative advocacy. These efforts resulted in the passage of favorable legislation for small business. During this effort he prepared and delivered expert witness testimony before Congress. Finally, he assisted in the rebirth of the Congressional Hispanic Caucus. Most recently he was Vice President Business Development for T.E. Systems, Inc., a high tech company providing best value solutions to computer and management related challenges. In less than one year, he secured the distributorship of very sophisticated electronic commerce/electronic data interchange software products and placed these products in the GSA Schedule. Additionally, he led the proposal efforts that culminated in the award of two large competitive contracts to conduct specialized customer satisfaction surveys for two major telecommunications companies. Finally, he successfully negotiated teaming arrangements with several larger companies thus insuring the steady growth of T.E. Systems. Inc. In 1996 he joined AlliedSignal Aerospace Company as the General Manager for their Huntsville, Alabama Office where he is responsible for AlliedSignal's marketing, sales and support activities with NASA's Marshall Space Center and the US Army's Aviation and Missile Command at the Redstone Arsenal in Huntsville, Alabama. He is a commercial pilot, a certified Spanish-English diplomatic translator-interpreter, and has published 64 Spanish/English articles in various U.S. and foreign journals. These have appeared in publications such as Asomante, Revista del Instituto de Cultura Puertorriquena, Journal of Inter American Studies, Revista Aeronoutica Boliviana, Revista del Ej�rcito del Aire Espanol, Checkpoints, and Armed Forces Journal International. His 536 page textbook, Military History of Puerto Rico was published in 1992 by Spain's Fifth Centennial Commission. He and his wife, the former Joan Leah Blanco of San Juan, Puerto Rico, make their home in Madison, Alabama and have two sons. Hector Emilio, a graduate of the Wharton School of Finance is a Vice President-Derivatives for Societe Generale Bank in New York City. Xavier Andres, a graduate of Bucknell University is a Certified Public Accountant for J.P. Morgan Bank in New York City. Yauco, Puerto Rico is located in the southern part of the Island. YAUCO, one of Puerto Rico's 78 municipalities, has played an important role in the Negroni Family in Puerto Rico. It was formally founded as a town by a Spanish Royal Decree dated 28 September 1756, thus becoming the 17th town founded in Puerto Rico. Prior to its creation as a town in 1756, the area around Yauco had been colonized by a group of families whose descendants are still living in the area. These families were the Pacheco de Matos, Rodriguez de la Seda, de Torres y Figueroa, Pagan, Quinones, Ortiz de la Renta, de Rivera, Perez, Sedeno, Troche, Borrero, de Lugo, Collazo, and the Lopez de Victoria. One of the events that prompted the movement to America was the 1815 Spanish Royal Decree of Graces (Real Cedula de Gracias) which fostered the immigration of Catholics of non-Hispanic origin to the former colonies of Spain in the New World (Cuba, Dominican Republic and Puerto Rico). Under the Real Cedula de Gracias through which immigrants were initially given a Letter of Domicile after swearing loyalty to the Spanish King and allegiance to the Catholic Church. After five years they could request a Letter of Naturalization that made them full-fledged Spanish subjects. The most characteristic note of Yauco's population is the presence of large numbers of Corsicans. Of the 128 foreigners that came to Yauco in the 19th century, 115 were Corsicans! A total of at least 379 Corsicans came to Puerto Rico in the 19th century; therefore, Yauco absorbed almost one third of that total. This is the reason why in Puerto Rico, Yauco is also known as a "Corsican town". Yauco was also a rich agricultural area where the three main crops were coffee, sugar cane, and tobacco. The last two have almost disappeared but coffee is experiencing a tremendous rebirth. Coffee was introduced to Puerto Rico in 1720 but since the beginning of the 19th century, Yauco's coffee has had world recognition and is one of the preferred gourmet coffees in Europe. Although its exportability suffered with the change of government between Spain and the US, it has finally overcome some of the obstacles to establish itself once again as "the gourmet coffee of the world." The importance and relevance of coffee was one of the many contributions made by the Corsicans in Puerto Rico. and particularly around the coffee growing region of Yauco. As a result the name Yauco became synonymous with coffee. Negroni Family - Rogliano, Corsica ROGLIANO, the seat of government for the Lordship of San Colombano, Corsica is located in the interior of the island. The town of Rogliano is the historical capital of northern Cap Corse, or more specifically of the Lordship of San Colombano, feudal domain founded by the Da Mare Family in the 12th Century which passed to the Negroni Family in the l6th Century. --Marchesa Maria Virginia Doria de Franceschi. With the recognition of the Negrone de San Colombano Family as part of the French nobility in 1772, under the name Castagnola-Negrone, --Paolo Maria Giovannni Giacomo changed his name to --Paul Marie Jean Jacques de Negroni de San Colombano. Marchese Paolo Maria Giovanni Negrone de San Colombano, 1st Marquis de Negroni married in 1789 --Comtessa Maria Ana de Mattei Antoni (daughter of) --Comte Paolo de Mattei and Marchesa Maria Vittoria Antoni. Paul Marie Jean Jacques and Maria Ana had nine children. The oldest male, Pierre Jean de Negroni de San Colombano, moved to France in 1850 where he established the de Negroni de San Colombano Family in France. It is Interesting to note that the Head of the Negroni Family in France since 1960, Francois Louis Hubert Marquis de Negroni, acquired through a combination of inheritance and purchased the last remaining property of the Negroni Family in Corsica, the Torre San Colombano located close to the Old and the New Castles of San Colombano and overlooking the ancient town of Rogliano. This way, Francois has returned the family to its Corsican roots. Through his efforts, this 15th century landmark was restored to its former grandeur. In 1556, Giacomo Negrone de San Colombano (son of Francesco Negrone, the founder of the Negroni Family in Corsica) constructed the Castle of San Colombano, a new family residence (known locally as the Castello)(Castle of San Colombano, 27 January 1754 -14 October 1828). at the foot of the Chateau Fort and using stones from the original quarry. 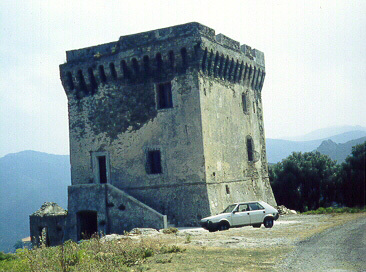 The Castello was continually occupied between 1556 until 1947, when it accidentally burned down during one of the many grass fires that affect Corsica. The construction would have been saved, but allegedly the front door was left open and the fire was able to penetrate the interior of the home. The ruins of the Castello allow us to see today that it was a typical stone-built Corsican home consisting of three stories and 12 bedrooms. During my cousin Hector's two visits to Corsica (1978 and 1980) he spend his vacations living, eating and sleeping within its walls and felt the strong historical significance of this ancient structure. A building associated with the Negroni Family, the Monastero San Francesco (Convent of St. Francis) built in the l6th Century by the Negroni Family and restored in 1711. In the Chapel of St. Pasquale, located inside the Convent Church, we find the burial place of the Negroni de San Colombano Family in Corsica. The place is in ruins because the monastery and church were closed in 1789 as a result of the French Revolution. It was sold in a public auction to the Lucchetti Family. Today they use it as a weekend retreat and a summer home. Hector's family were privileged to enjoy a sumptuous banquet in its Grand Dining Room as guests of the Lucchetti Family. One of the first, if not the first, Corsicans that came to Puerto Rico was Domingo Mattei Antoni who lived in Yauco. 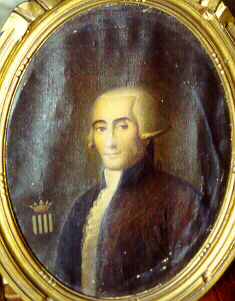 Domingo was the product of two noble families, recognized as part of the French nobility during the end of the 18th century. He was followed by his nephew Antonio Francisco Negroni Mattei, another scion of a noble family. Don Antonio Francisco Negroni Mattei - The founder of the Negroni Family in Puerto Rico was Antoine Francois de Negroni de San Colombano (Castle of San Colombano, born 1794, died in Yauco, 2 April 1861). Upon his arrival in 1822 to Puerto Rico he changed his name to Antonio Francisco Negroni Mattei. Although his passport indicates that he was born in 1794. Antoine Francois established the Negroni Family in Puerto Rico. He married three times. His first marriage was 18 May 1826 in Yauco to Rita Rodriguez de la Seda y Lopez de Victoria (born in Yauco, 1808, died. in Yauco, 12 December 1839). She was the daughter of Pascual Rodriguez de la Seda y Lopez de Victoria (Yauco, 1756-Yauco, 22 January 1823), who had been the mayor of Yauco 1811-1817 and of Maria Luisa Lopez de Victoria (Yauco, 1772-Yauco, 18 November 1850). [My family connection is with--Rita Rodriquez de la Seda Lopez de Victoria.] She was Antonio Francisco Negroni Mattei 1st wife. Family Tree access on the Index page of my site. On the 1st of June 1822 Antonio Francisco received his Letter of Naturalization. He rapidly integrated into the political and military elite of Puerto Rico. Eight years later he was appointed commander of the Yauco Urban Militia Corps and serving in that capacity from 1830 to 1840. In 1838 he was appointed major of Yauco. He served as major from 1838 to 1843 and again in 1846. In 1848 he was appointed by the Captain General of Puerto Rico as Teniente a guerra (supreme civil and military authority in the town of Yauco). 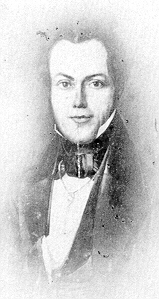 From 1847 to his death in 1861, he was a corresponding member of the pretigious Economic Society of Friends of the Country), an organization devoted to the improvement of the Puerto Rico economy. He devoted his life to agriculture and in 1840 established his plantation (hacienda) Florida. This plantation was built on land formerly owned by the Pacheco de Matos family. Six year later this plantation was Yauco's largest with an area of approximately 970 acres), worked by 38 slaves and having a declared capital of 23,661pesos ( note that the Governor and Captain General of Puerto Rico had a monthly salary of 183 pesos! By 1851, Antonio Francisco had 41 slaves. In 1850 Puerto Rico's first irrigation system was built by Antonio Francisco. In 1852 he sold the plantation to Juan Maria Antongiori. Shortly thereafter Antonio Francisco founded another sugar plantation, hacienda San Colombano, in the Barrio Playa of the town of Guayanilla. The cholera epidemic of 1856 was a severe blow to Antonio Francisco's agricultural enterprises because it killed most of his slaves. In December 1862 San Colombano was sold to the firm Tirado & Labarthe. Antonio Francisco was also a coffee grower and his coffee plantation La Fortuna in Barrio Indiera Alta in Maricao was inherited by his daughter Maria Luisa and from there passed into the Lluch Family by marriage. Two principal residences were owned by Antonio Francisco -- Casa Agostini -- Don Antonio Francisco Negroni Mattei's daughter --Maria Victoria Negroni Rodriguez (1838-1900) who married Ignacio Agostini and later inherited this residence-- and a two story masonry country home in his hacienda La Florida which allegedly was one of the finest in Puerto Rico. 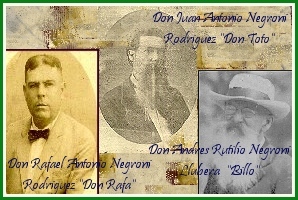 To review the complete Historical Summary of the Negroni Family go to: La Genealogía de Puerto Rico (Genealogy of Puerto Rico) material written by my cousin Hector Andres Negroni Becerra.